GOP to Obama: Stop Scaring Seniors. That's Our Job. At a closed door meeting about the budget on Wednesday, House Republican leaders reportedly got testy with President Obama over his portrayals of their Medicare plan. House Majority Leader Eric Cantor told Politico that "We pressed him repeatedly to stop the demagoguery" and, according to various accounts, Budget Chairman Paul Ryan specifically took Obama to task for describing the proposal as a scheme to introduce "vouchers." 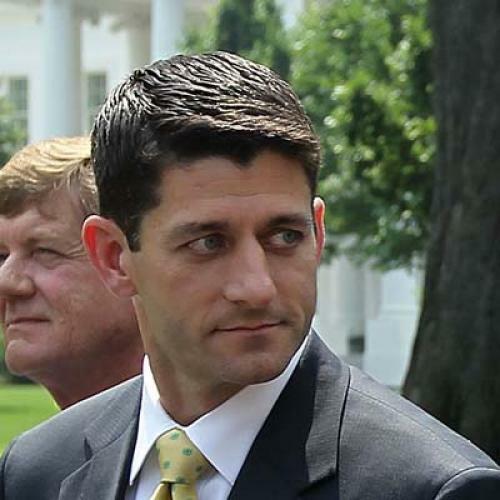 It’s a little hard to take seriously the Republicans trying to shame Obama and other Democrats out of vilifying Paul Ryan’s plan to overhaul Medicare. GOP lawmakers and candidates for office -- although not Ryan primarily -- spent 2009 and 2010 convincing the public that the Affordable Care Act would gut Medicare and even lead to “death panels.” (A recap: there are no death panels, the program retains its fundamental shape as a single-payer government system and cuts to Medicare called for in Obamacare, while significant and diverted to fund new subsidies for non-seniors, total about $500 billion over 10 years. The program’s annual budget is about $500 billion.) Yet, Republicans – stung by polling showing that the Ryan plan to transform Medicare into a much cheaper, privatized system is unpopular – are calling on Democrats to end their “Mediscare” campaign. Basically, Republicans want Obama to stop giving his accurate descriptions of their Medicare plans, so they can get back to giving their inaccurate portrayals of his. And people wonder why it's hard to have a grown-up conversation about the deficit.